Jainism faced declination in Tamil land after second half of 7th century. This was time of Bhakti movement and rising of other faiths like Vaishnavism and Shaivism. Jainism and Other faiths had been coexisting in Tamil land for ancient time. Conversion and re conversion of one faith to another faith was common in laity along with the king of that empire. Jainism faced crucial time during these 4-5 centuries after 7 century. After this crucial time Jainism folded to some particular region of Tamil land but it’s Existence in Tamilnadu never ended. Some Followers migrated to Karnataka where Jainism was patronized by most of the emperors. Some followers of Jainism in Tamil land converted to Shaivism and Vaishnavism. Although conversion took place but it was so deeply penetrated in the civilization that it affected many principles and rituals in Jainism way. Thenparankundram :- This place is situated about 11 kms from Madurai city in South west direction. This place is nearby Thiruparankundram Jain and hindu pilgrimage. In fact this Place is another part of the same hillock which contains Thiruparankundram Jain caves. The Temple, now called as `Umai Andvar Koil' (with Lord Shiva in the form of `Arthanareeswarar') by the locals, was originally a Jain Cave Temple dating back to first century B.C. The earliest practice of Jainism has been proved with the help of tamil brahmi inscription found at the walls of temple as well as another inscription of Prasanna Deva . 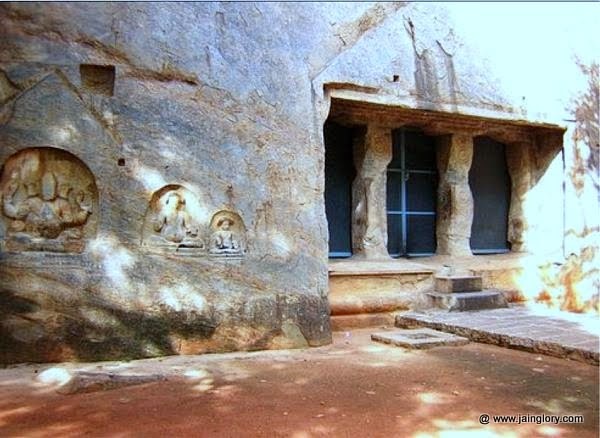 According to Assistant Director of Tamilnadu Archaeology Department; Mr. C. Santhalingam ; This cave had been used as abode by Digamber Jaina monks since 1 century BC. All the arrangements for Jaina monks were ensured by Rulers so that Monks can practice penance and secluded life over here. He also pointed out one more clue related to Jainism that is carvings of papal tree on the right of top bas relief deity which affirm the concern with Jainism. Thenparankundram is a protected monument under ASI. More ancient Tamil inscriptions belonging to the 13th century A.D., refer to seven years of Maravarma Sundara Pandian reign (1216-1238) are also seen here. The inscriptions further reveal that Saiva Saint Prasanna Deva converted the Jain monument as Umai Andavar Temple and named it after the King as `Sundara Pandian Eswarar' Temple. On the outer walls, the three great Saiva saints --Thirugnanasambandar, Thirunavukkarasar, Sundarar - are sculpted out. Figures of two more Saiva saints are also there, one of them perhaps being that of Prasanna Deva.